It meant “comes with a built-in handle in its plastic assembly”. – Rare Earth, “Live in Concert”, in which the band gets into about 28 minutes of “Get Ready” at a stadium rock concert. The album cover is cutting edge graphic design: it looks like a backpack. For 45 singles you can make a playlist of about 5 songs by stacking the 45s on the spindle – once you’ve added the plastic adaptor to match up to the wider hole of a 45rpm single. Singles had B Sides that were just filler, with a few priceless exceptions, like “Little Deuce Coup” and “409” by The Beach Boys. The automatic turntable drops a record down onto the spinning record platter, then the stylus drops the needle directly on the start of the groove. 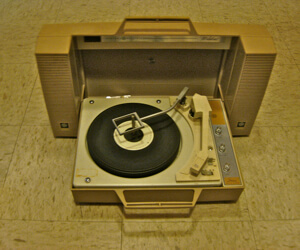 It plays a record, then switches itself off when it comes to the end – this was a selling point. That way you can play yourself to sleep. Not a sleep timer, but a mechanical shut-off after it cycled through its mechanical process. “Long ago and oh so far away, I fell in love with you before the second show. After Sister had this for about 3 months, I broke the turntable by forcing it to play backwards. I was listening for messages from the devil via Three Dog Night. My Dad fixed it, or course, because at that age nothing could happen that Daddy couldn’t make right. It worked again just fine and I learned to keep my hands off of it. It was hers. Not mine. It was all a part of growing up. Recently I retrieved it from the attic because I hoped it’d be a good conversation piece. Too much care-giving and nursing got in the way (chemo, food, medicine, rest). But I did get a chance to tell Sister about seeing the old turntable, which brought up shared memories of when we had grown big enough to choose our own music. kinda blank at first, then a gentle realization that I was onto something good, which means it was something good for her, too. Her intentionally pesky little brother had a secret nickname, “Burden”, but she never called me that in front of anyone. She was a really good Sister.